How much does it cost to travel to Calgary? How much money will you need in Calgary? CA$155 ($116) is the average daily price for traveling in Calgary. The average price of food for one day is CA$26 ($20). The average price of a hotel for a couple is CA$152 ($113). Additional pricing is in the table below. These average travel prices have been collected from other travelers to help you plan your own travel budget. How much money do I need for Calgary? Calgary is the largest city in Alberta and, located at the edge of the prairie and foothills, it is a gateway to the Rocky Mountains. If you're headed to Banff or Jasper, this is likely to be your first stop. It's also Canada's fourth largest city and worth a few days visit. Calgary's economy is diverse, but includes energy, financial services, film and television, transportation, technology, manufacturing, and much more. Calgary's climate is humid continental. Highs in July are around 75 degrees Fahrenheit and highs in January are usually around 27 degrees Fahrenheit. There are over 300 days of sun a year. There are some wonderful sights throughout Calgary. You should definitely visit Prince's Island Park, which is the city's largest city park. It's an island in the Bow River, and has a handful of wonderful trails. The park also hosts plenty of festivals, particularly in the summer months when the weather is more pleasant. Barclay Mall is a pedestrian area between Eau claire and Stephen Avenue. This area has plenty of shops and a wonderful atmosphere. Stephen Avenue Walk is one of the city's most famous streets. It is a National Historic District and has many boutique shops, interesting restaurants, and pubs or bars. The area is traffic free during the day. Other areas worth visiting include Stephen Avenue Walk, Chinatown, the Olympic Plaza, the Glenbow Museum, Calgary Tower, Calgary Zoo, and much more. There are a handful of neighborhoods that are worth exploring throughout Calgary. The Beltline and 17th Avenue are the trendiest areas with plenty of restaurants, shopping, bars, and clubs. The nightlife in this area is popular among local celebrities and athletes. If you're looking for some great shopping, head over to Kensington, which is north of the downtown area near the Bow River. It has a bohemian atmosphere, and also has plenty of restaurants, cafes, and coffee shops. Inglewood is a culturally rich and eclectic area in Calgary that once served as the downtown area. It is also the oldest neighborhood in the city. It's again gaining a trendy feel and has plenty of shops and restaurants, although they are not as dense as the current downtown area. 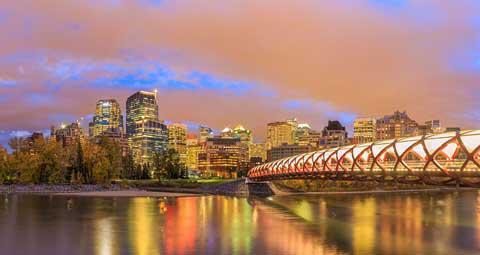 As a large city, there are many activities that you can enjoy in Calgary. The theater scene is well established, with EPCOR Centre for the Performing Arts hosting the city's three most famous professional theater groups. Other theaters in the city include Vertigo Theatre, Theatre Junction, Pumphouse Theatre, Loose Moose Theatre, and Lunchbox Theatre, among others. For recreational activities, consider visiting Glenmore Reservoir where you can sail, kayak, or canoe. Canada Olympic Park has skiing, snowboarding, luging, and many other winter sports. This is a training facility and lessons are available for many sports. There are several great shopping areas in Calgary. Inglewood is interesting as there are few chain businesses. The area has many interesting coffee shops, art galleries, or furniture shops. Other area's for shopping include Stephen Avenue, 17 Avenue SW, and Kensington District. There is a wide selection of dining options available in Calgary. The city is very proud of Alberta Beef, and steakhouses are plentiful. The city's diverse population means that there are many different international restaurants, including Asian, Mediterranean, and Middle Eastern. In particular, Vietnamese food is very common and usually very affordable. Downtown restaurants can get crowded around noon during the work week. It's best to eat slightly earlier or later. Calgary has a decent public transportation system and it is not necessary to have a car to get around the city. The system improved dramatically in 1988 when Calgary hosted the Winter Olympics. There's an efficient light rail system that covers the downtown area and surrounding neighborhoods. If you're planning to head further into the suburbs you may need to take a bus. Buses are not as frequent as the light rail, but it's an easy system to navigate. Downtown Calgary is relatively easy to walk around. Most workers use the pathway system, Eau Claire Market area, and Stephne Avenue Mall (8th Avenue) when the weather is pleasant. During the colder months most people use the Plus 15 system which has enclosed walkways between buildings.